The built in Mac speakers aren’t really adequate for playing rich loud music or media, so you’ll want to get a better set. What kind of speakers to will want depend on your needs, but I’d recommend getting a quality set for your home workstation and then if you’re a road warrior get a separate set of portable speakers. I’ll go over a few options that I have direct experience with here. Audioengine A5 Powered Multimedia Speaker System – $325 – The sound quality on the AudioEngine A5’s is nothing short of absolutely amazing, with some great features to boot. The speakers include easy line-in to hookup your iPod/iPhone, a USB port to charge your iPod, a power outlet for hooking up an Airport Express, a built-in amplifier, and did I mention seriously amazing sound? I heard these at a friends house and knew I had to get a set myself. If you’re a music lover, audiophile, or a musician and you want truly amazing sound on a budget, just stop reading and get these speakers, your ears will thank you. No more 128kbps audio files with these, you’ll want to play 256kbps or better. My only complaint is that they don’t include a remote control. The AudioEngine A5’s come in black, white , and a snazzy bamboo . I have to rave about the AudioEngine’s because they are without a doubt the best speakers I’ve heard at anything even close to the price range. For a Mac (or iPod or any PC really) they produce the highest quality sound possible without spending a ton of money. Altec Lansing BXR1220 2.0 Speakers – $15 – these are small speakers with surprisingly decent sound for their size. Don’t expect deep rich bass or anything though, it’s just not really possible with something this compact and without a subwoofer. Logitech S220 2.1 Speakers with Subwoofer – $24 – Now if you’re less concerned about space and portability, for about $25 these speakers produce some great bass thanks to the included subwoofer. A friend of mine has these hooked up his MacBook and plays them quite loud at BBQ’s and I’m always impressed that for the sound quality they’re so cheap. Altec Lansing VS4121 Audio System – $60 – I had a pair of Altec Lansings just like these on my Mac before I got some AudioEngine A5’s, and I was always happy with their sound quality. The subwoofer helps produce rich bass and the speakers provide loud and quality sound for music, movies, and gaming. Altec Lansing iML237USB Ultra Portable Speakers – $49 – This thing is small and ultra portable, the main downside is that it draws from USB to take power so you’ll be losing a USB port. If you’re a serious roadwarrior though and you’re more concerned with bag space than overall sound richness and just need something loud for teleconferencing, entertainment, or presentations, this is a good choice. I first saw one of these when a someone brought it out of his bag during a presentation, it looked like a chubby YoYo. B-Flex 2 Stereo USB Speaker – $39 – These are a fascinating speaker, it plugs into your USB port and then has a flexible arm to aim in any which direction. I admit I haven’t heard these myself but they were recommended by a friend for their portability and sound quality, and I trust his opinion so Ill include them. For maximum portability and cord-free speakers these look like a great bet. 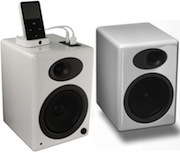 What about speakers for the Mac Pro and Mac Mini? My suggestions for the Mac Mini would be the same as the other Mac’s, but since the Mini is so tiny and stylish I figure Mini owners will be more particular about the appearance of their speakers. In regards to the Mac Pro, since it’s more of a professionals machine I would imagine a Mac Pro user would want professional grade speakers, while the AudioEngine A5’s certainly meet that requirement on a budget, there are other options geared specifically towards audio professionals, but I have no personal experience with that kind of high-end sound equipment. Obviously there are many other options out there for Mac speakers, but these are just the ones I have come across relatively recently. Feel free to share your own speaker suggestions or experiences in the comments. I am using the X-Minimax2 from XMI. These are really small and amazing portable speakers, which sound very well for their size. You can find them at http://www.x-mini.com/. You should have stopped after the first suggestion because the others don’t even compare to the 5 series. I have a set of Audioengines in my living room hooked up to my TV for gaming, movies, and my ipod and I love them. Be sure to follow the manual and go through with the break-in period, they suggest 48 hours of continuous play but I think the full sound really developed after a couple weeks once the cones softened a bit. All of their audio equipment is phenomenal really. PS: If you like Michael Jackson check out this remix and play it LOUD on your AE5’s! What about a good headset for a softphone on the macbooks? the audioengines are great. f you want something smaller, try these http://www.edifier-audio.co.uk/proddata.php?partno=E5000 suprisingly loud, down to about 80hz. Holy crap I just got a pair of the AudioEngines, THEY ARE AWESOME!!!!!!!!!!!!!!!!! I can’t recommend these enough, unbelievable sound! After you get them through the break-in period that all speakers have to go through these things just freaking ROCK, I am so stoked! I think the current imac speakers are fine they have some base and sound real crisp. but my macbook lacks any base at all but like the imac is clear thats what i love about the current mac speakers.